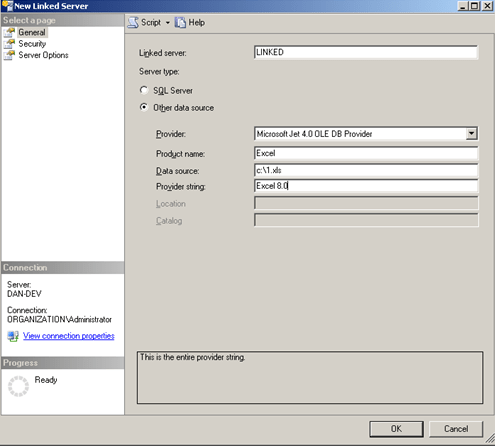 Here’s another way to created a linked server using another provider, Microsoft Jet 4.0 OLE DB Provider. This is for SQL Server 2008. Check out my previous Linked Server tutorial if needed for SQL Server 2005. For this setup, let’s use the login’s current security context. 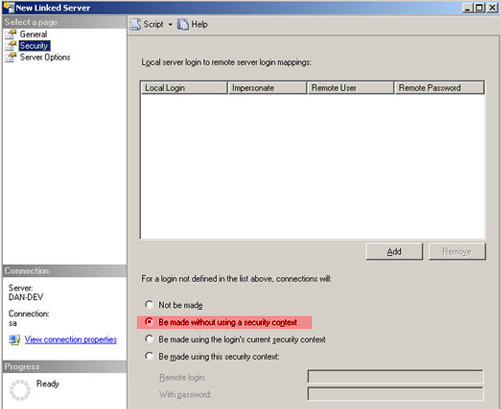 Make sure that you whatever SSMS you use to connect to the server uses the same user credentials as user that created the linked server. So if I create that on a server, then I’ll have query it using the same credentials just used. If you want to know how to query it, check out my Previous Tutorial. This is a new job that is created by default on SQL Server 2008. By default, the job will most likely fail unless you fix it. The purpose of this job is to purge unneeded information coming from SQL Server 2008’s new Policy Management features. More about this particular issue. More about Policy-Based Management by Pinal Dave. This feature was introduced on SQL Server 2005. It’s a great way to query another query on the fly. I prefer using these over derived tables (DTs) because it provides more flexibility. Some people report better performance using Common Table Expressions (CTEs). I’ve seen and heard both though (that DTs are faster), but I suppose it depends. Just test it out and see for yourself. Anywhoot, let’s play with CTEs. First let’s create two tables with dummy data. -- It persists for the life of this query. I had to import information from an Excel file with datasheets that had 40+ columns. Using SSIS could be a bit tricky sometimes, so I decided to use a linked server. This feature works well. It’s fast and less of a headache than SSIS. Originally designed for connecting to other databases, you can use it to import information by linking to a file. This is how I went about it (this is for SQL Server 2005) in importing an Excel (.xls) file. Since I’m using this on a local machine, I don’t have to worry about security too much. Select "Be made without using a security context" under the Security section. Select your Server Options. I suggest these settings for local access. SQL Server reads a spreadsheet in a workbook as a table. So now that we’ve created our linked server, let’s see how to query them. Since I don’t always want to rely on the linked server, create tables into my general database where I slice and dice data. 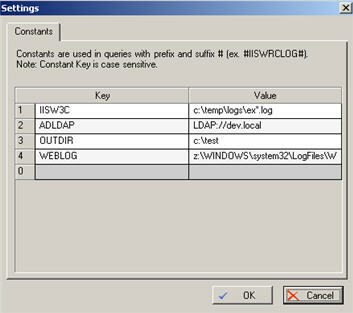 LogParser is a great way to query IIS logs (any text log, actually, that is delimited). LogParser will even generate graphs (.gif format) of your results. 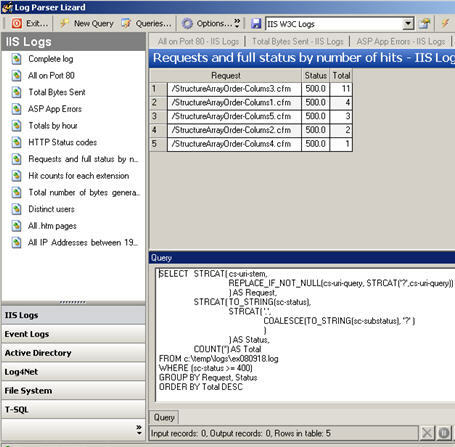 If you want to use a GUI for your queries, I suggest you try Log Parser Lizard. 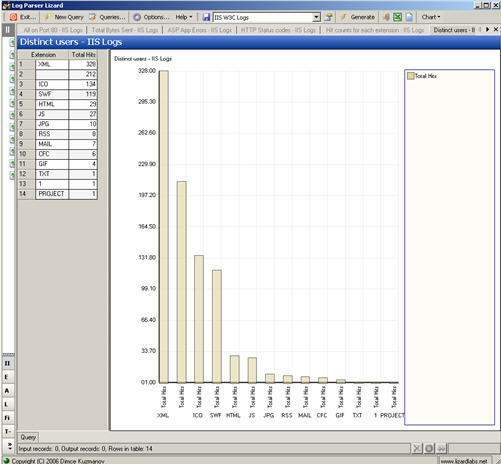 Today I needed to analyze some forum data from vBulletin running MySQL. The table on MySQL had 60,000 records. Because my playing field is SQL Server and not MySQL, and I needed to slice and dice the data, I needed a way to get the data onto SQL Server. Because of some security restrictions, I could not set up a linked server on SQL Server. I don’t have remote access to the Linux box either. I tried exporting from SQLYog, but CSV data could not be properly delimited and failed when I did a database import via the SSIS import wizard (the table has a lot of flexability to use any character and is often abused by spammers). What did I do? I only had 4 columns to import for the table. So I ran a select statement returning one column ordered by the id. Then I copied and pasted into an Excel spreadsheet. I did this for all four rows. Because Excel doesn’t use delimiters, but rather cells to separate, I didn’t have to worry about data breaking. Then after that, I did an import via the SSIS import wizard. Ta-da, I can now slice and dice my data. There are probably more efficient ways to do this, but I needed a quick solution and this did it. Ever have to bulk import a text file (e.g. from Excel, or tabular delimited rows) into a table that had the first column be an identity auto-incrementing primary key? Yes, you could create a format file that skips the identity column, so that the first column of your text file doesn’t go into the identity column of your table. This MSDN page shows more about it. The quick way though, is to create a view of that table and omit the identity column when you create the view. In this manner, your first column in the text file won’t map to the identity column and throw one of those delicious BCP errors. While working with some IIS logs, I decided to start practicing my Python. I put together some handy Python functions to work with IIS Log files. These will come in handy. On a 3GB, 2.5GHz, running WinXP machine, these functions take about 3 seconds to process a 180MB Text file. Python code could be optimized to be faster if you’re dealing with larger sized files. 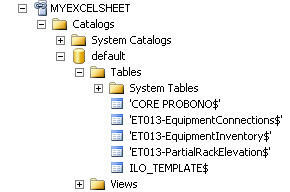 # in IIS, it creates a new row full of columns. MainLogDelimiter = "#Software: Microsoft Internet Information Services 6.0"
# Search for a file recursively from a root directory. #  rootpath  = root directory to start searching from. # TODO: Use the glob module instead. Could be faster. # of the log file. # row that may exist in case new columns were added/subtracted in IIS. # This gets all the columns from a log file. print file, "not the same"
Install Pywin32. Get the latest. It’s a dependency for pyodbc. Install pyodbc. Get it for the version of Python you’re using. For more snippets and a tutorial, check out the documentation. Now let’s try something more interesting. Let’s try doing some inserts and see how long it takes. # Let's insert two pieces of data, both random UUIDs. sql = "INSERT INTO Manager VALUES( '" + str( uuid.uuid4() ) + "', '" + str( uuid.uuid4() ) + "' )"
print "\n\nProcess took", _total * .001, "seconds"
After some tests, 10,000 records took roughly 20-30 seconds. 1,000,000 records took 30 to 40 minutes. A bit slow, but it’s not a server machine. My machine is a Core Duo, 1.8Ghz x 2, at ~4GB with PAE on WindowsXP, but I ran this on a VMware VM with 1GB and SQL Server 2005 w/Windows Server 2003. The table was a two column table both varchar(50). On a server machine, it should be a helluva lot faster.